Amazing tattoo ink done. 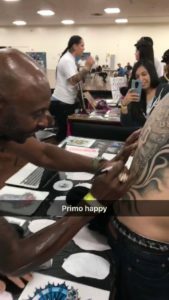 Check out Eddie’s niner tattoos. Niner Empire founder Joe Leonor had the opportunity to meet Eddie at a game last year. He was sitting next to him in section 133 at Levi’s Stadium. As they talked about their love for the niners Eddie started to tell him about his tattoos. 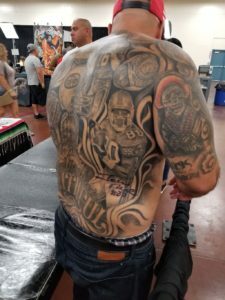 Eddie then took off his shirt and proudly showed his back which was covered with 49er history. 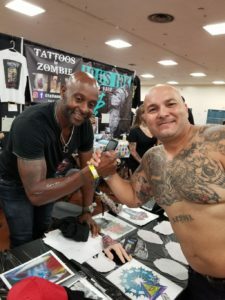 Just recently Eddie had the opportunity to see Hall of Famer Jerry Rice at a tattoo convention. So what did he do. Eddie got it signed by the greatest Wide Receiver of all time and then had the autograph tatted on the picture of #80 on his back. Check out Photos below. Eddie stated that every session was approximately 8-12 hours and took approximately 2.5 years.